The Port of Rotterdam. Photo credit: Freek van Arkel. In this era of ever-changing technology, we often hear about new initiatives that shape our lives in ways that were previously unimaginable. Though many of these inventions are tangible in the most literal of senses, such as the case of smartphones and wearable technology, there are other digital improvements which change our world in ways that may be less obvious to the average consumer. One of the latest technologies to emerge is the "smart port", which is changing the ways goods are received and shipped. It is a change in which the Port of Rotterdam is leading the way. In brief, a smart port is a port that uses digital technology to improve its operations. In the case of Rotterdam, the changes are coming through with help with IBM Internet of Things (IoT) technologies as well as from IBM Cloud. If you live in Europe, there is a good chance that the things you buy have been acquainted with the Port of Rotterdam in some way. After all, it handles more goods than any other port on the continent; product comes in through Rotterdam and is diffused throughout Europe through an elaborate system of rivers, trains, and roads. This being said, it's clear why the port's digitization is big news for the economy of Europe, and even the world. 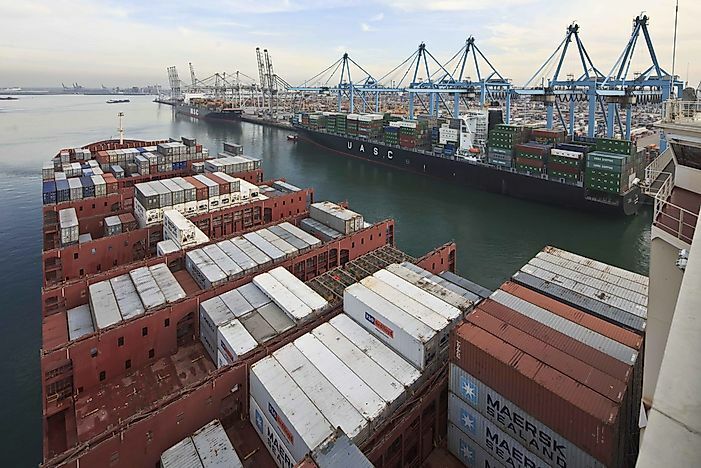 World Atlas spoke with Ronald Teijken, the Business Partner Manager of IBM Watson Internet of Things for Belgium, Netherlands, and Luxembourg, about what being a smart port means for the busy Port of Rotterdam. WA: What would having autonomous ships mean for the economy as a whole? What are the ways that it would change the way that goods are transported between countries? RT: With more than 85% of all globally traded goods having travelled on a ship at least once during their lifecycle, ports play a key role in the global and local economy. Connected and autonomous ships will be able to take advantage of real-time water, weather, sensor and communications data collected by cloud-based IoT technologies in ports such as the Port of Rotterdam, to determine the best time to dock, load and unload – saving time and money by tangibly increasing efficiency. Additionally, similar to driverless cars, connected ships operate autonomously and communicate with each other to avoid the risk of a collision. WA:What makes Rotterdam a good location for the world's most high-tech port? RT:The Port of Rotterdam, Europe's largest by cargo tonnage, plays a key role in the global and local economy. The Port of Rotterdam is one of the strategic logistical hubs into the European mainland (shipping, road-traffic and railway). As the largest port in Europe, the Port of Rotterdam handles over 461 million tonnes of cargo and more than 140,000 vessels annually making it a great candidate to lead the industry in digital transformation. On top of that, we have been a leader in service quality, employing 90,000 people, and for six consecutive years, Dutch port infrastructure has been named best in the world by the World Economic Forum. We are committed to innovating and ensuring we have the capabilities to adapt emerging technologies in order to continue playing this central role in the European economy. WA: How does having a smart port improve efficiency? RT: Being better able to predict visibility on a given day will help calculate clearance heights for ships, and predicting water conditions, wind direction and speed, will help determine how smooth a ship’s entry into port is likely to be. This data will also have a significant positive economic impact on shipping costs –calm water and weather conditions allow for lower fuel consumption rates, facilitate cost-effective per-ship payloads and facilitate the safe arrival of cargo. Sensors being installed at the Port of Rotterdam across 42-kilometers of land and sea - spanning from the City of Rotterdam into the North Sea - along the Port’s quay walls, mooring posts and roads will relay real-time information about a variety of different factors from weather to water levels to berth availability. This data will then be analyzed by IBM’s cloud-based IoT technologies and translated into information relayed to the Port in order to make decisions on when and where to dock incoming ships, as well as the best times to load and unload. With this detailed information informing their decision making process, shipping companies and the port stand to save up to one hour in berthing time, which can amount to about $80,000 US dollars in savings for ship operators. What’s Next For the World of Shipment? In addition to the other high-tech changes brought to the Port of Rotterdam, a 3D printing lab called the Rotterdam Additive Manufacturing Lab, or RAMLAB, is being established at the Port’s shipyards. Again using IBM IoT technology, the lab is capable of printing spare ship parts such as propellers using robotic arms. Interestingly, while the process of replacing a ship’s components is one that can take up to eight weeks, the new RAMLAB means it can be done in around just eight days. These amazing time and cost-saving initiatives are sure to shape the world of shipping. The emergence of these innovations are not only timely and exciting, but are also more important than ever in today's globalized world. Rachel Cribby is a Montreal-based writer and editor.